DB Groundworks Daniel Baxter has over 10 years experience in creating beautifully crafted patios, block paving and driveways, having formally worked for local builders before starting out on his own in 2010. DB Groundworks can offer patios and block paving to your exact requirements, dramatically improving the appearance of your garden and driveway. 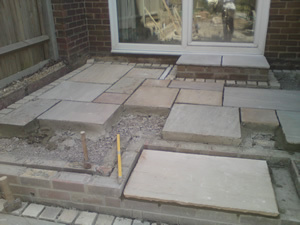 We can also offer the treatment and care of old weathered drives and block paving to bring back that NEW feel once more. An old block paved driveway can, with some care and attention be transformed from old and sunken to lifted and sparkling again. Specialised products are also used to protect and seal existing driveways and patios, the protection is largely used on drives to protect it from car oils and grime. Please view our Gallery, and contact us to see what we can achieve for your outdoor space.